MSI introduced the Radeon HD 5830, claiming it's the coolest Radeon HD 5830 on the market. The card uses the Twin Frozr II cooler, which should cut temperatures by up to 12°C compared the cooler of the reference design. The world leading graphics card and mainboard brand-manufacturer, MSI, today officially releases its R5830 Twin Frozr II graphics card. MSI R5830 Twin Frozr II uses ATI Radeon HD 5830 GPU with 1120 units of stream processors and 1GB GDDR5 high speed memory to provide the latest DirectX 11 games with stunning visual effects to gamers. Equipped with excusive Twin Frozr II Thermal design, R5830 Twin Frozr II is 12℃ cooler thanks to dual 8CM PWM fans and quad Heatpipes. The most powerful Afterburner overclocking software supports over voltage function of GPU on R5830 Twin Frozr, tweaking the GPU's voltage to have better overclocking performance. In addition, to have better stability and lifespan, R5830 Twin Frozr II chooses the high quality Military class components to build the best HD 5830 card! Advanced Twin Frozr II Thermal Design – 12℃ cooler! For heat dissipation, the MSI R5830 Twin Frozr II graphic card uses the advanced Twin Frozr II thermal design. This is supplemented by dual 8CM PWM fans and quad heat pipes to draw and dissipate waste heat away from the graphics card. Real-world tests show that MSI's proprietary Twin Frozr II cooling can reduce temperatures by up to 12℃ when compared to the reference cooler, making it quite an advanced cooling system. Apart from the greatly improved thermal design, the R5830 Twin Frozr II graphics card comes with MSI's proprietary Afterburner overclocking software. Apart from the standard GPU and memory clock frequency adjustments, Afterburner can also change the GPU voltage to 1.35v to unleash its full performance! As for the components, MSI R5830 Twin Frozr II uses military class materials to ensure the best stability and longer lifespan. This includes the Hi-c CAP for the GPU power supply, solid state capacitors to extend the graphics card's overall service life, and solid state inductors that prevent high-frequency noise when overclocked or under high loads. 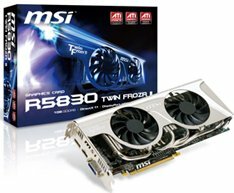 MSI R5830 Twin Frozr II graphics card supports ATI exclusive Eyefinity technology that can run 3 monitor outputs simultaneously by single card. R5830 Twin Frozr II is also compatible with DirectX 11, having the most realistic gaming experience. With the support of ATI stream technology, R5830 Twin Frozr II is able to accelerate specific programs by GPU's power.